It can be so easy to splurge during the holidays, especially when it comes to desserts! You can save on precious holiday calories by preparing healthier versions of your favorite holiday sweets with VOSKOS® Greek Yogurt. Did you know that most of the VOSKOS® Greek Yogurt products are fat free? This makes it a delicious, and health-conscious addition to your favorite recipes. Check out our 3 favorite healthier holiday dessert recipes this season. You’ll be able to enjoy yourself without that extra guilt that comes after the holidays. Greek Yogurt Vanilla Cupcakes – Bring these delicious cupcakes to family gatherings or your office potluck and you will be very popular! These tasty cupcakes are made with whole-wheat flour and VOSKOS® Vanilla Greek Yogurt. They offer plenty of sweet, delectable flavor and have only 5.6 g of fat per cupcake thanks in part to the fat free yogurt. Decorate with red and green sprinkles, and your holiday dessert creation is done! 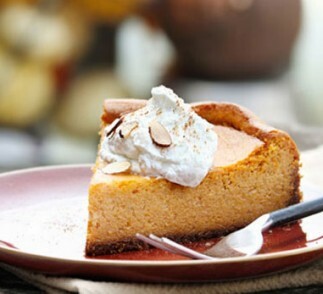 VOSKOS® Pumpkin Cheesecake – Let’s face it, anything pumpkin-flavored during the holidays is always a huge hit and our recipe for Pumpkin Cheesecake does not disappoint. All you need is a pre-made pie crust (or you can even use individual molds), nonfat cream cheese, VOSKOS® Plain Greek Yogurt and canned pumpkin pie filling. This cheesecake is incredibly easy to make and weighs in at only 152 calories per serving. Honey-Pumpkin French Toast – If you are planning a Christmas brunch or traditionally make a special Christmas breakfast, then this Honey-Pumpkin French Toast is the perfect thing. This recipe is so rich in flavor and wonderfully sweet it’s like dessert for breakfast–without the hefty calories. It’s also very simple to make, all you need is a ½ cup of nonfat VOSKOS® Honey Greek Yogurt, pumpkin puree, vanilla extract, 2 tablespoons honey and pumpkin pie spice—that’s it! All you have to do is mix the ingredients and make as you would regular French toast. Rich honey and spiced pumpkin make the perfect holiday flavor pair. With these desserts, you don’t have to miss out on all of the holiday food and fun—we’ve taken the hard work out of eating healthy. Your family and friends will love the sweet-tasting decadence of these healthier holiday versions, and so will you. Happy holidays from our kitchen to yours!